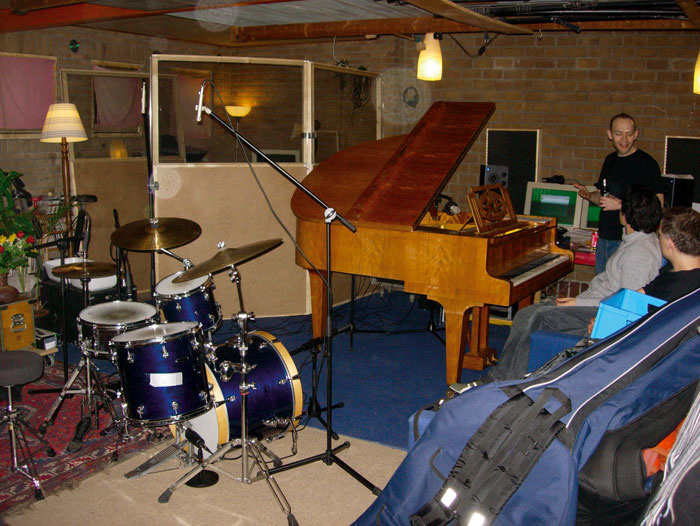 Here you can see how the instruments were set up for Jesper's recording, with the bass isolated from the drums and piano using part-glazed screens. We help a home recordist on a budget to add that elusive polish to his jazz-trio recordings. Many of the songs sent in to Mix Rescue do indeed need salvaging, but occasionally something comes in that makes a pleasant break from the norm. 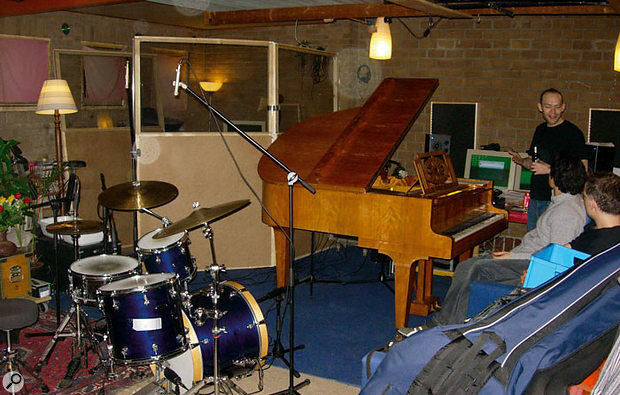 Jesper Buhl's recording of his jazz trio was one such welcome submission, where he had managed to capture respectable signals from the ensemble performance, despite budget constraints, by careful placement and isolation of the piano, upright bass and drums within his home studio, which is a 7.5 x 7.5m converted garage. The bass player, Rico De Jeer, was set up towards one corner of the carpeted room, allowing him to be isolated pretty efficiently from the other instruments using three large studio panels (complete with glazed sections to preserve sight lines). The drums and piano were set up more towards the other side of the room, and Jesper had tried to reduce the levels of drum spill on the piano mics by turning the instrument so that its lid opened in the opposite direction, as well as by arranging four 2 x 4-foot absorber panels around it. The drums were played by Chris Barchet and recorded with a pair of Oktava MK012 cardioid small-diaphragm condensers running through Rane MS1B preamps into an Emu 1820M soundcard, the audio interface for Jesper's Cubase SX2 PC recording system (itself isolated in a purpose-built box to reduce noise). In addition to these mics, the bass drum had an AKG D112 in front of it and a Superlux ECOH6A large-diaphragm electret mic on the batter-head side. There was a Shure SM57 on the snare, as well as a separate small-diaphragm condenser on the hi-hat — although session gremlins ate the hi-hat signal before it could reach the recorder, so this last mic's signal wasn't available for mixing. All of the close mics were amplified by a Behringer ADA8000 preamp/converter before reaching the audio interface. 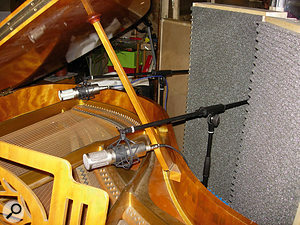 Another Superlux ECOH6A microphone was set up in front of the bass, after Jesper had tried and rejected both an SE Electronics SE2200A and a Studio Projects B3 in this role, while his Grotriam-Steinweg baby grand piano had two Studio Projects C3 mics (in cardioid mode) in a spaced stereo configuration over the strings. These mics also passed through the ADA8000. Jesper's original mix was already sensibly balanced — and by no means bad — but I felt that the drums seemed a bit too wide and the bass wasn't quite present enough. There was also a slightly unnatural reverb added to the piano, and it seemed rather 'stuck on'. So I asked him to send over his original multitrack files and loaded them into my own Cubase SX2 system to see if there was a better result to be had. The Jesper Buhl Trio (left to right): Jesper Buhl, Rico De Jeer and Chris Barchet.First taking up piano lessons at the age of seven, Jesper Buhl joined his first band in his early teens, playing blues and rock & roll. By high school, however, he'd moved more into the jazz field, following the inspiration of such masters of the ivories as Oscar Peterson and Bill Evans. When Miles Davis went electric, he became interested in synths and jazz fusion and moved to Copenhagen to pursue his musical interests. For 10 years he played with his band Blue Turtle, before studying at the Hilversum Conservatory, and subsequently formed another electric jazz fusion combo called Dino On The Loose, as well as becoming involved with the trip-hop-meets-jazz group Warp Expansion Protocol. This month's Mix Rescue song is 'What Is This Thing Called Love?' 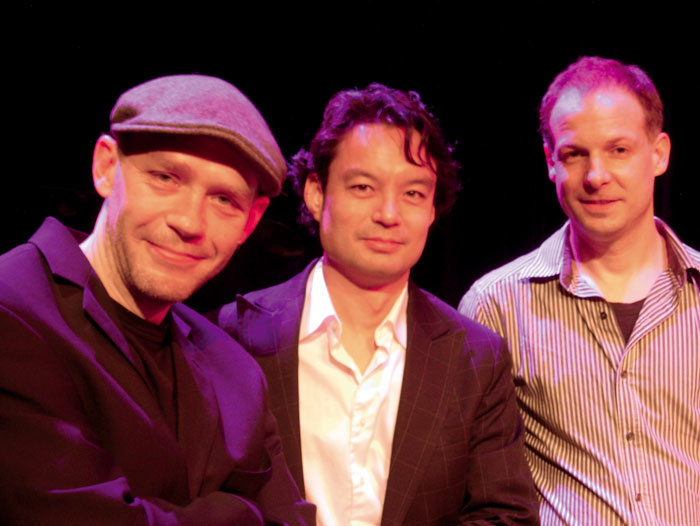 and was performed by Jesper at the piano, with Rico De Jeer on bass and Chris Barchet on drums. Jesper's main concern with his original tracks was the level of spill from the drums on the piano mics, despite the steps he'd taken to reduce it, so I started my listening there. As I'd suspected, it turned out that the spill wasn't too much for this style of music. More to the point, it happened to sound fairly pleasant, albeit with slightly elevated cymbal levels. I felt that the biggest problem was that panning the piano mics evenly placed the drum spill over on the right-hand side of the mix, so I resolved to pan the piano mics a little to the left of the drums to re-centre the spill. Placing the low piano mic 75 percent left and the high piano mic 35 percent right did the trick, while still leaving lots of stereo movement in the piano sound. Here you can see the parallel compression setting Mike used to improve the sustain of the piano part. Similar settings were used on the other parts, independently.I listened to the drum overheads next, which had very low levels of spill from the other instruments but a very wide stereo image, so I reduced the panning to 50 percent left/right. The timbre was pretty good straight away (although with very little bass drum level), so I had a quick listen to the bass mic. This had a fair bit of spill on it from both of the other instruments, but again Jesper had managed to keep this sounding fairly benign. I panned the bass 20 percent to the right, in order to balance the piano image, but without giving a seriously lopsided low-end picture. Despite Jesper's efforts to isolate the instruments, the bottom line is that spill is an inherent part of recordings like this. With so many mics picking up the same sounds (either directly or as spill), phase-cancellation between the different mic signals becomes an important factor, so it's pointless trying to process any mic in isolation. For this reason, my first real mixing task was simply to fade up the piano, bass and drum-overhead mics to give a rough balance, and then listen to how they interacted with different polarity settings. After a little experimentation, however, I liked the default settings best — another point on Jesper's score-card! — so I turned my attention, first of all, to rounding out the balance of the drums coming through the overheads, by using the close mics. 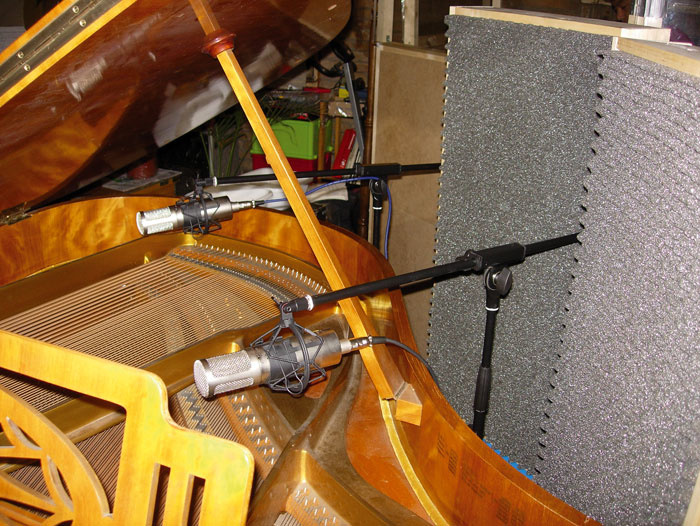 A spaced pair of Studio Projects C3 mics were used to capture the piano sound, while four acoustic absorber panels were arranged to try to reduce spill from the drums.The bass drum was most obviously missing in action, so I checked out the two relevant close mics. The AKG D112 at the front of the kick presented a rather unappealing and coloured sound (which I'd probably have tried to remedy on the session in Jesper's position), so I faded up the batter-side mic instead. This didn't have the same amount of body to it as the D112, and also included an undesirable low-frequency ringing, but the spill from the rest of the kit was very well behaved indeed, and the resonance was quickly taken care of with an 8dB notch at 100Hz. Again, I checked the polarity of this mic against the rest of the mix, but this time found that an inverted setting gave a more solid sound. As it happened, the level of snare spill on this mic was so high that I found myself reaching almost instinctively for some processing to reduce it. However, after a moment's thought I realised that this snare spill was, in fact, exactly what the overheads needed to bring the snare forward in the mix, so I stepped away from the plug-in menu with my hands in the air... In the event, this snare spill was something of a stroke of luck, as the snare sound coming through the close mic was a bit dodgy — woolly and resonant, with some nasty spill emphasising the stick noise from the ride cymbal. Although the drum sound was now pretty much in the right ball-park, I tried mixing in the D112 as well to see what it would sound like in context, and discovered that a little bit of it gave a more rounded sound to the kick, once I'd found the best polarity setting. With the majority of the mix balance in place, I could concentrate on some processing. My main aim was to try to increase the sustain and detail of each of the parts, and for this I turned to parallel compression — in other words, using compression as a send effect rather than as an insert. The advantage of the parallel approach is that you can smooth the levels without as much impact on the transients and performance dynamics that are so important to acoustic music styles. 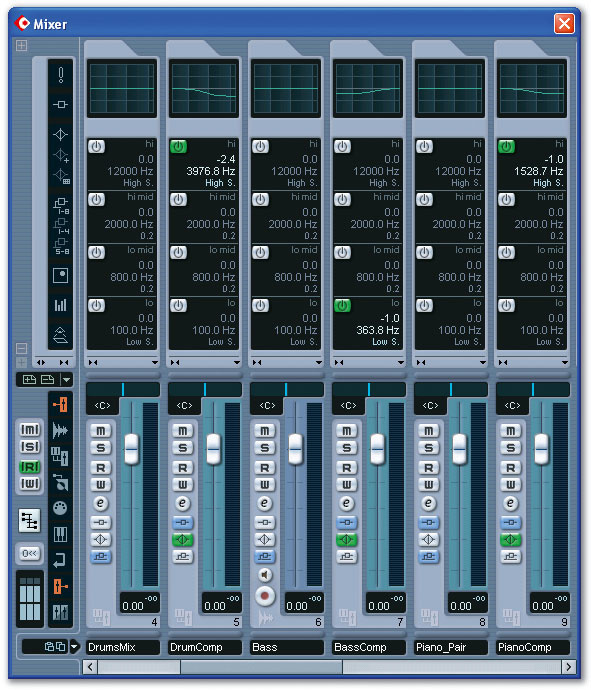 A little shelving EQ was used in each of the parallel compressor return channels, to help tailor the effect to each part.By now I'd bussed each of the parts to its own Group channel in Cubase, and from each of these groups I set up a send to a separate instance of Buzzroom's Gran Comp. 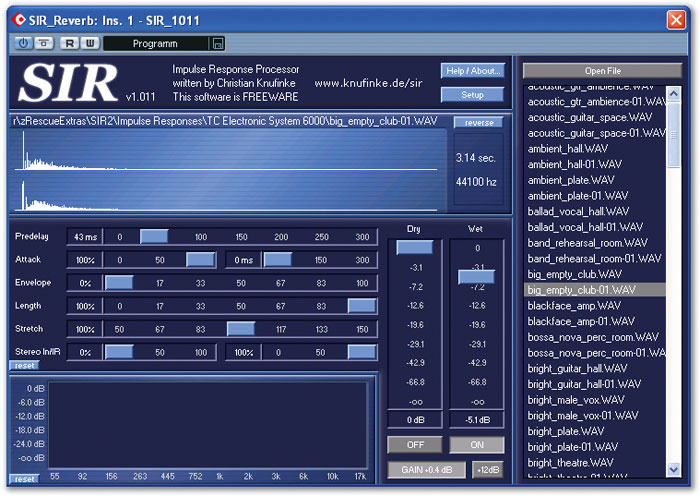 Starting with the piano compressor, I left the release time set to automatic but set the attack as fast as possible, effectively ducking the transients and therefore favouring the sustain elements in the compressed signal. With a fairly low ratio of 1.7:1, I adjusted the threshold to give a few decibels of gain reduction, before mixing some of the compressed feed with the uncompressed signal. I then made identical settings on the bass and drum compressors, as a starting point. I liked the effect I was getting from the three compressors straight away, and while I chose to use more compression than some purists might, the changes were still fairly subtle, bringing up the ambience from the room and improving the audibility of softer details. However, I did make some tweaks to my initial settings, to improve things further. The cymbals were already quite prominent in the mix, so I gave them a little less support from the compressor by cutting 2.5dB from the compressed signal with a high shelf at 2.5kHz. In a similar way, I felt that the piano's low notes seemed to need more sustain than the high notes, so I cut a decibel from the piano's compressor signal with a 1.5kHz high shelf. However, this left the high notes slightly low in level, so I increased the level of the high-strings mic by 0.8dB to compensate. Conversely, with the bass compressor I cut a decibel at 360Hz, using a low shelf to highlight the upper harmonics a little more. I also increased this compressor's ratio to 2:1 and switched to a release of 65ms, to make the sustain effect more overt. Despite this, the odd note would occasionally poke out unduly, so I bussed the compressed and uncompressed signals together and applied a traditional insert compressor to the resulting Group channel, just to catch these few moments (for the rest of the time the insert compressor wasn't doing anything at all). Jesper Buhl: "Even though my original mix wasn't exactly screwed up (reading SOS for the last 10 years must have paid off to some extent! ), it was quite obvious that something was lacking. It didn't sound exactly like a record, only quite close, but at the same time I couldn't think of anything I wanted to change in my final mix. "When Mike had finished working his magic, everything sounded more defined and punchy, as if all of the instruments were suddenly out in the room belonging together, and not behind screens. A friend has compared it favourably to some of his favourite '50s jazz recordings, saying that it has precisely the same atmosphere and sound, and I tend to agree. 'More powerful' is another description several of my music-playing buddies have used. Everybody loves the new panning (my drums were way too wide) and the piano also somehow seems wider and more impressive. "I've already learned a ton of new tricks — for example, using compression on the sends instead of on the inserts — but it's going to take a while before I've digested all the advice on offer here! This has been a real eye-opener and I'm grateful to SOS, and Mike in particular, for giving me this opportunity. As a bonus, it seems that Mike and I have been using the same version of Cubase, and he's offered to send me his Cubase Project file so that I can use his settings for my entire CD — everything was recorded in one session, so all I should have to do is change the automation for each track. Isn't that just great?" The general sound was now shaping up nicely, with the parallel compression adding a nice sense of immediacy and atmosphere, so I bussed all the tracks for each instrument to three Group channels, to allow easier control over the relative levels. I was now keen to try to 'glue' the instruments together a little more, as well as creating the impression of a slightly larger space, so I fired up Christian Knufinke's SIR convolution reverb plug-in and surfed through some impulse responses until I found a three-second 'empty club' preset that sounded promising. Because SIR doesn't offer true-stereo processing, I reduced the send to the effect to mono, to avoid any odd stereo artifacts that might have drawn undue attention to the effect. Only one reverb was used, a convolution patch from the SIR plug-in. 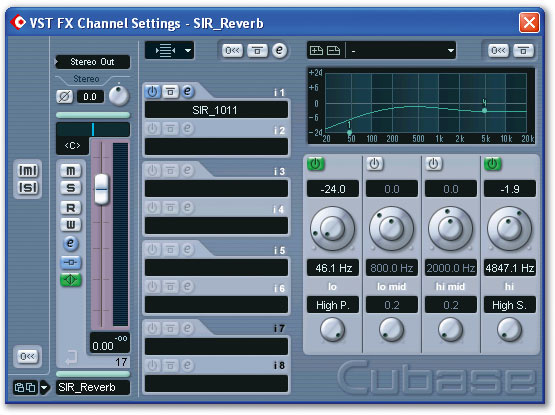 Once a suitable impulse response had been found, some careful pre-delay and EQ tweaks were applied to optimise it further.I applied a little reverb to each of the three Group channels, increasing the reverb's pre-delay to prevent it pushing anything too much into the background. Although I liked what the reverb was adding to the bass overall, it was also bloating the low end a tad, so I high-pass-filtered the reverb return gently, progressively reducing the reverb level below about 200Hz. The cymbals were also hitting the reverb a little hard, so I cut a couple of decibels out of the reverb at 4.8kHz to keep the balance from becoming over-bright. Listening again for tonal problems, I noticed that some of the lower bass notes seemed a little uneven, booming out and making the occasional phrase awkward and lumpy. I set up a very narrow peaking filter, hunted around at the low end, and then notched the offending frequency (105Hz) by a couple of decibels to sort this out, but once this was attended to, I felt that the whole of the low end of the bass part could come up a notch, so boosted 1dB at 81Hz with a low shelving filter. Another narrow little 5dB notch proved useful at 175Hz on the overhead mics, to take out a slightly tubby ringing on one of the toms. The only other processing that was required was some compression of the high frequencies on the overhead mics and the bass mic. In the case of the overheads, I felt that the level of stick noise on the cymbals was a bit distracting, but didn't want to just cut high-end from the overheads (as that would have compromised the rest of the drum sound). Setting up just the high band of GVSTs GMulti multi-band compressor to respond quickly to level spikes in the frequency range above 5kHz helped take the edge off the problem, although I kept the compression ratio low (1.4:1) and bypassed this effect using Cubase's automation during the bass and drum solos, where it wasn't necessary. For the bass, a similar setting was used for the region above 2.5kHz, to rein in some over-enthusiastic string slaps. 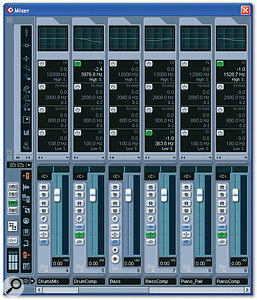 A little more fader automation was the next step, to push up the levels of the bass and drum solos when they occurred. In the case of the drum solos, I also turned down the piano mics a touch, in order to reduce the amount of spill/ambience slightly in these sections. As a final polish on the mix, I used Buzzroom's Gene Comp to apply some low-threshold 1.1:1-ratio bus compression and followed it up with GVSTs GMax limiter, skimming only the very loudest peaks with a short (50ms) release, to enable me to achieve a little bit of extra loudness. To be honest, with acoustic music like this the majority of the work needs to happen in the live room, so Jesper's efforts while tracking made it possible for me to concentrate on polishing (rather than salvaging) his tracks at mixdown. In this kind of happy situation, the mix processing can be kept subtle and precisely directed (with fewer undesirable side-effects), and the natural spill between the instruments will often work in your favour, giving a lively, organic quality to the final result. This project also serves as a powerful reminder of just how much can be achieved through great musicianship and common-sense mic technique — even when using budget equipment.